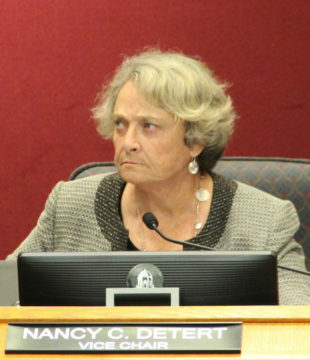 Sarasota County Commissioner Nancy Detert pushed back the hardest. 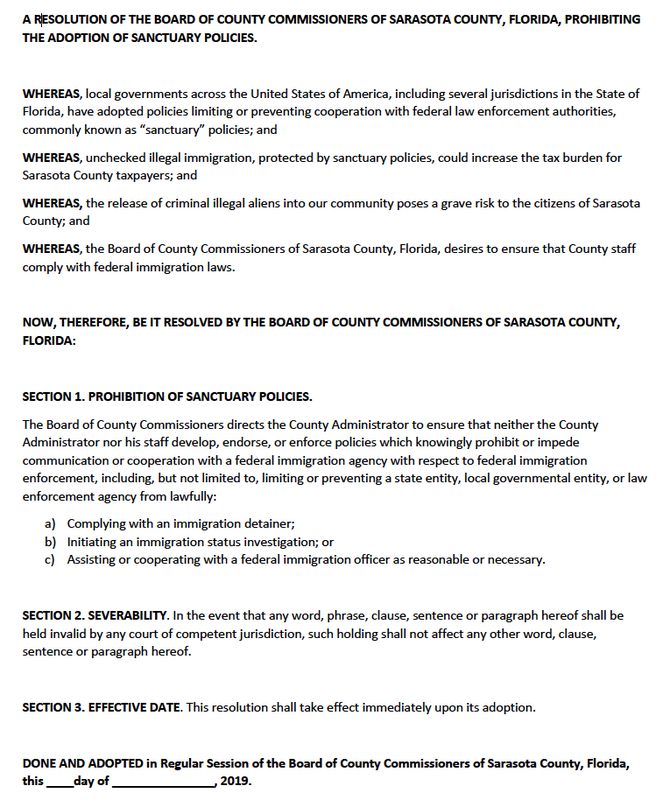 Nevertheless, the three other board members joined her this week in asking Commissioner Christian Ziegler to wait until after the conclusion of the Florida legislative session to bring back before them a resolution calling for the prohibition of sanctuary policies for undocumented immigrants charged with crimes in Sarasota County. State Sen. Joe Gruters of Sarasota — who also is chair of the Florida Republican Party — has sponsored a bill that would give the state attorney general the authority to take action against local governments adopting sanctuary policies. 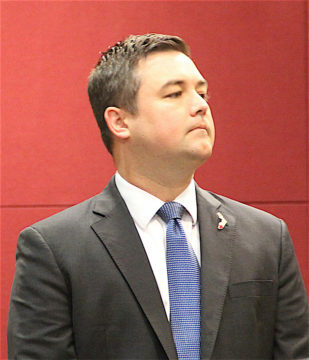 Ziegler is vice chair of the state Republican Party. “This is one of the top issues that came up last year when I was running for this office,” Ziegler said on April 9 as he brought up his proposed resolution during the Board Reports segment of the commission’s regular meeting in Venice. “People are concerned,” Ziegler stressed to his colleagues. Then he pointed out that since Sheriff Tom Knight took office in 2009, “513 criminal immigrants from 35 countries” had been deported from Sarasota County. Among the nations of origin for those people, Ziegler continued, were England, Scotland, Poland and Russia. As of Feb. 12, Ziegler added, 54 foreign-born arrestees were in the Sheriff’s Office’s custody, and 13 had “ICE interest,” which essentially meant — he said — that they had been flagged by U.S. Immigrations and Customs Enforcement (ICE) for deportation. Ziegler added that he does not believe that County Administrator Jonathan Lewis has any intention of seeking a sanctuary designation for the county. Ziegler noted that his own father lives in Serbia. Moreover, he said, later that day, he planned to fill out the necessary paperwork to seek a Green Card to bring his brother legally to the U.S. from Serbia. Chair Charles Hines did point out that, by law, one county commission cannot bind future boards to any policy. Commissioner Alan Maio then said, “I don’t have a problem with this [proposal].” Nonetheless, he concurred with the suggestion that Ziegler wait for the outcome of Gruters’ efforts on the bill in the Legislature. Ziegler pointed out that he felt passage of the resolution that day would express “our community support” for Gruters’ initiative. As of April 9, when checking the proposed legislation’s status in the Florida Senate’s online records, the News Leader found that an amended version of Senate Bill 168 last saw action on March 14, when it had its first reading during a meeting of the Senate Infrastructure and Security Committee. Commissioner Michael Moran concurred with Maio on April 9, adding that he would like to be able to talk with Knight himself about the proposed resolution. “It is a very political hot button,” Chair Charles Hines said. Further, Hines pointed out, “Sheriff Knight is a separately elected constitutional officer. … He runs the jail on our behalf,” though the commission funds the jail operations. “The County Commission controls the purse strings,” Ziegler concurred with Hines’ latter statement. “I just think you’re creating a firestorm where you don’t need to,” Detert told Ziegler. “Hopefully, we can consider this in the future,” Ziegler said.